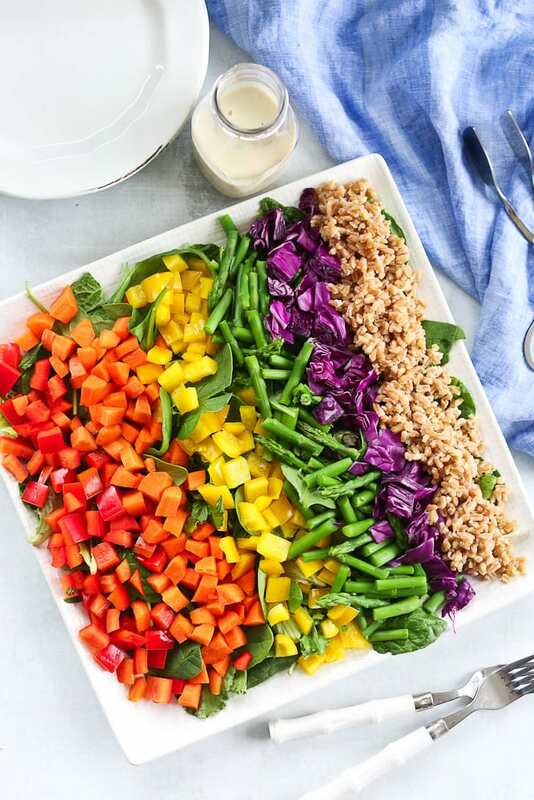 This Rainbow Farro Salad is as beautiful as it is nutritious and delicious! You’ve heard the phrase ‘Eat the rainbow’, right? Today, we are quite literally eating the rainbow. Okay, maybe not literally. We aren’t eating the sky. But we are eating all the colors today. And that’s exactly what we should be trying to do daily or at least weekly. Eating a wide variety of different colored foods. Why? 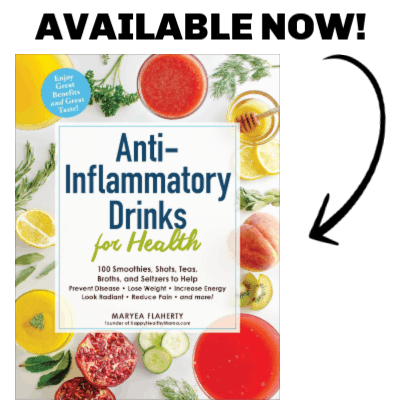 Because different phytonutrients are found different colored produce and if we leave out a color of food, we are likely leaving out really important nutrients. So let’s celebrate eating the rainbow with this Rainbow Farro Salad. It makes it really easy! Let’s start with the elephant in the room. You may have clicked on this recipe because you saw all the bright, pretty vegetables in the photo, but have no clue what farro even is. Don’t worry. Even the manager of the natural foods section in one particular grocery store was lost when I asked why they didn’t stock farro. Apparently it’s not that mainstream. Farro is an ancient wheat grain that’s been eaten for thousands of years. (Heads up: farro is not gluten free) It’s hearty, has a nutty flavor that I love, and is a great source of protein, fiber, magnesium, and iron. It’s considered a whole (not refined) grain. I love farro salad because it’s a great way to add some bulk to a veggie-rich salad. It makes it more filling and satisfying. This Rainbow Farro Salad is really versatile. As you can see in the photos, it makes a beautiful presentation that is company-worthy. I think this would be a beautiful addition to your Easter table. On the other hand, it makes a fantastic meal-prep lunch option. Make this on Sunday, and you’ll have a work week’s worth of lunches. I made a tahini lemon dressing that is bright, flavorful, oil free, and compliments the vegetables perfectly. 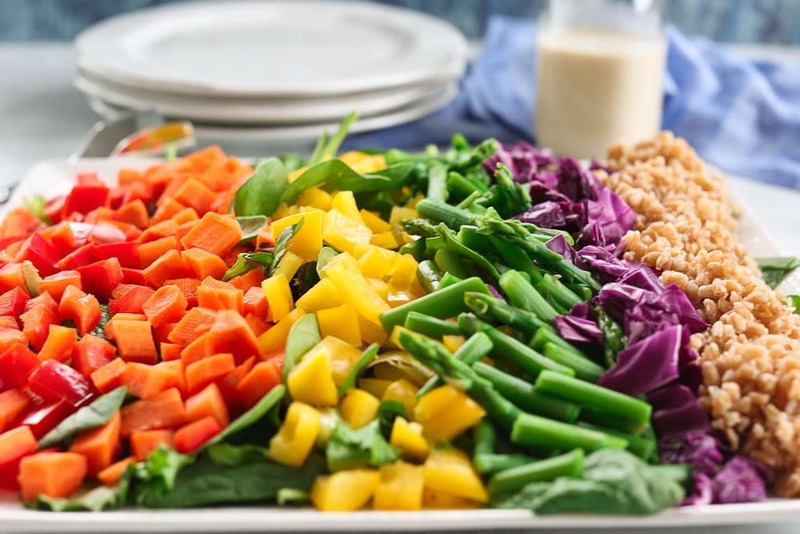 I hope you LOVE this Rainbow Farro Salad as much as my family did! This Rainbow Farro Salad is made with a tahini lemon dressing and it as beautiful as it is nutritious! Combine the spring greens and fresh basil. To assemble your salad, start with the greens on the bottom, then add each vegetable in a row as shown, and then add a row of farro. You can either serve on a platter and allow people to serve themselves from the platter and dress their own salads or you can toss and dress the salad just before serving. Enjoy! If you make this Rainbow Farro Salad recipe, or any Happy Healthy Mama recipe, I would LOVE to see it! Please take a pic and share it on Instagram or the Happy Healthy Mama Facebook page and tag me @happyhealthymama ? Looking for more healthy salad recipes? You’ll love this collection!